Due to staff annual leave Catch 23 will be closed on the above dates. 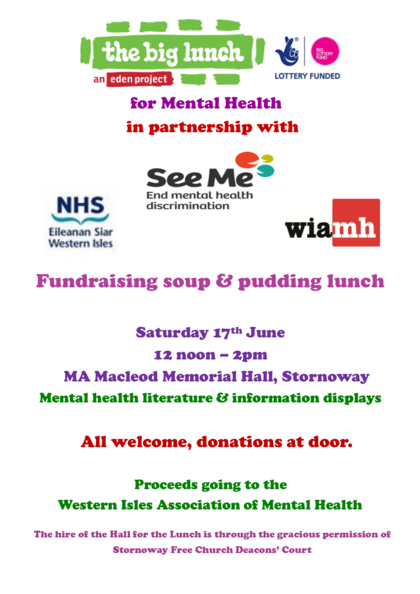 A reminder that it is the Soup & Pudding event at the MA Hall in Stornoway this Saturday 17th June. As such the drop- in will not be open as all staff and volunteers will be involved with this. Unfortunately we will also not be open on Wednesday 21st June as staff and volunteers will be attending all day training. Funding news- The Gordon & Ena Baxter Foundation have kindly awarded the Association with a grant of £500 towards the costs of our Arts and Writing group sessions. Thanks to everyone who chose us as their preferred charity over the last 6 months and big thanks to the local Co-op in Stornoway for nominating us to receive this funding. Due to staff being involved in our book launch next Thursday evening,6th April at Woodlands Centre, Catch 23 will not be open that day.